It’s a brand new year! One resolution we should all make (and KEEP) this year is to get our finances into shape. 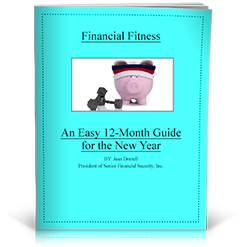 Let me help you with this free month-to-month guide that’s easy to follow and will help you achieve financial fitness. Please fill in the fields below to download your copy of ‘Financial Fitness: An Easy 12-Month Guide for the New Year’.